beaTunes 4 is a good example of a what a hybrid library sorting app should be: It has enough automated features so you can “set and forget” it and let it do its job to tidy up your collection, and at the same time it has a few essential user-generated characteristics that let you truly create a custom classification system that you can call your own. Spend some time getting to grips with it and you’re well on your way to an organised collection. beaTunes 4 looks a lot like the way an Apple app does, although it looks a bit more confusing than iTunes at first. It does get simpler after a few uses, especially once you’ve read the online FAQ. My concern here, of course, is that consumer software has reached a point where reading a manual first before using it has become somewhat a somewhat antiquated practice. In other words, user-friendliness has become a gold standard as well and unfortunately beaTunes 4 is quite lacking in that aspect at first contact. The good news is that it’s a small hurdle to jump in order to reach a goal that will pay dividends time and time again. I plunged headfirst into the app, using a newly created iTunes library with just a handful of tracks. I was excited to see how beaTunes would categorise my songs according to its own system, so I went to my Library list, highlighted a few tracks and clicked “New Matchlist”. I wanted the app to sort according to BPM, so I did that and clicked OK. Puzzled, I repeated this to the point of frustration, and that’s when I decided to check the online manual, only to find out I had missed the most important part of the entire process: Analysing. In beaTunes, importing your iTunes library (or any piece of music, for that matter) doesn’t mean it gets analysed, so what we have here is a two-step process: Analyse your tracks after importing them in beaTunes first, and then proceed to create playlists and sort them properly. Call me old fashioned, but it’d be really convenient if the import and analysis consisted of one step! A music library analysed by beaTunes looks like this: Neat, properly filled, and capable of being sorted. All my tracks had data that was pertinent to me as a DJ. Aside from the artist and track name, I had the track’s BPM, musical key, as well its “colour”, which is a system used by beaTunes to determine how a track’s energy is manifest visually. 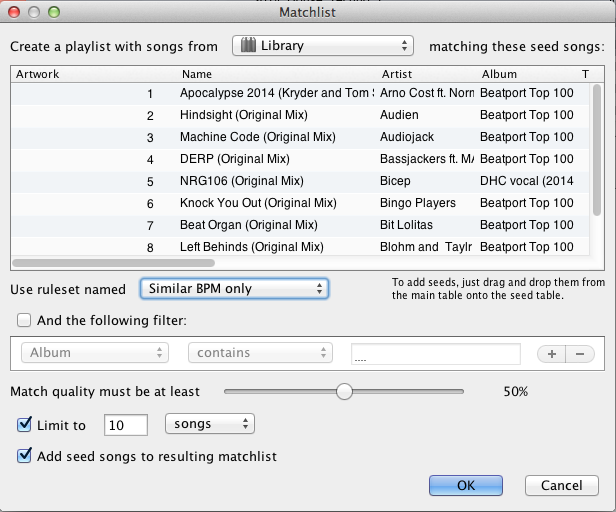 I was then able to sort them according to these characteristics and create matchlists automatically based on a few tags and fields that I could select for beaTunes. You can have beaTunes scour your entire music library for songs that match criteria that you specify, allowing you to create playlists quickly in abundance. 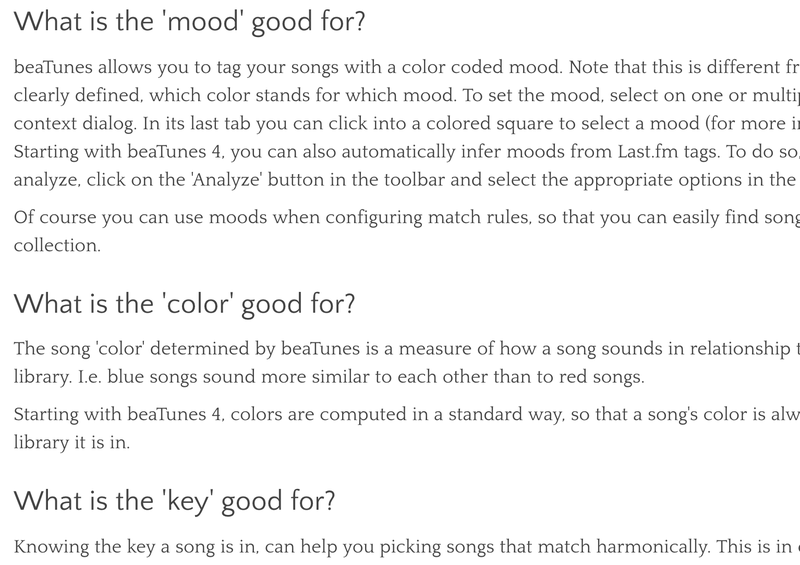 Apart from those automatically filled characteristics, beaTunes lets you manually specify other things like mood colour, tags, and a host of other sorting fields. Of course, beaTunes’ highlight is that it can create playlists for you that stretch beyond the usual “artist, album, genre” classifications. 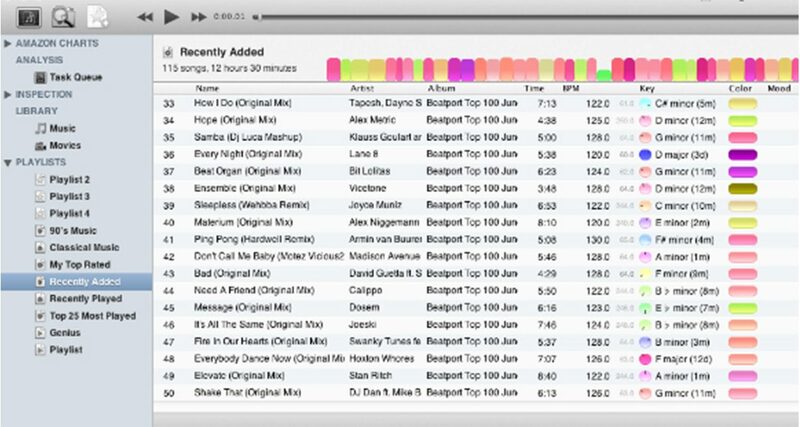 Having analysed your tracks, you can create a matchlist by specifying a ruleset (eg similar BPM, similar colour, etc.) 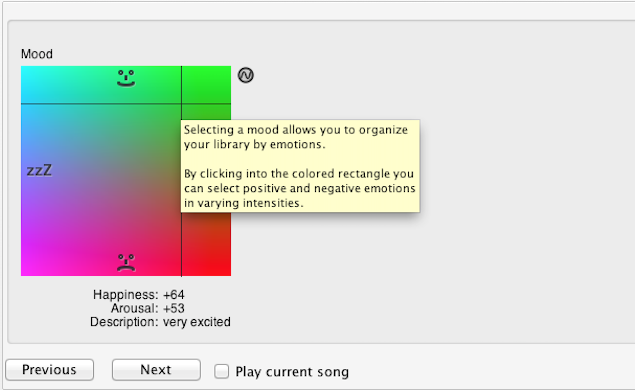 and then further filtering the results to really pinpoint an area in your library that you can create a playlist with. The software is a good example of a what a hybrid library sorting app should be: It has enough automated features so you can “set and forget” it and let it do its job to tidy up your collection, and at the same time it has a few essential user-generated characteristics that let you truly create a custom classification system that you can call your own. 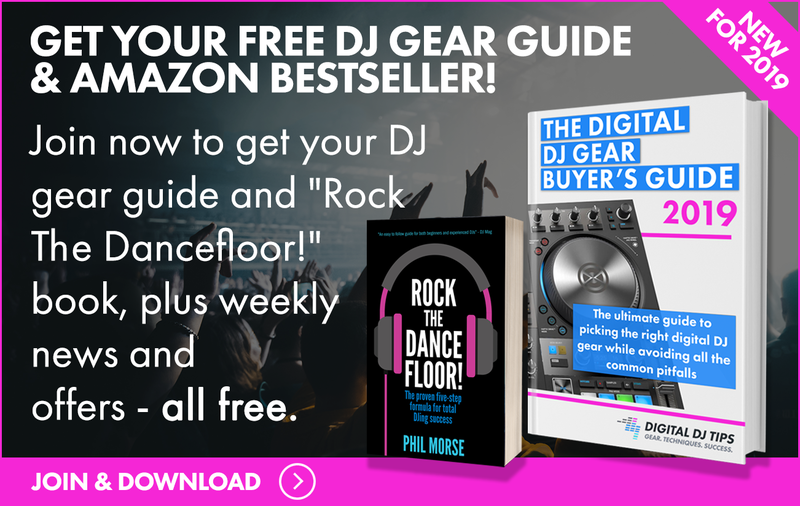 The ability to create highly specific playlists is a boon for DJs with a massive library who have a hard time keeping track and can aid in rediscovering tracks you’ve had in your hard drive for a while waiting to be spun again. Aside from the automatic data that beaTunes fetches and fills in, you can also add your own tags and characteristics, such as this mood picker. Personally, the biggest issue with beaTunes is that it doesn’t come with a “Quick Start” guide of any sort (at least my copy didn’t), and it doesn’t have a manual online as well, just an FAQ that could be arranged in a more comprehensive fashion. This can make it a bit confusing for first timers, but the resulting deep analysis and properly sorted library make for an excellent tradeoff. If you’ve got a collection of music that you don’t have time to tame, I can’t recommend this enough. Just wrap your head around the way it works at the start, and you’ll be on your way to fixing your library once and for all!